New Castle is the smallest town in NH covering only .8 square miles. The state of New Hampshire is located within the New England region of the United States and got its name from the southern English county called Hampshire. 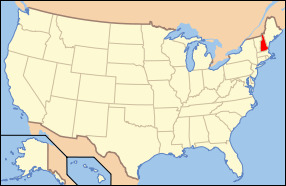 The state is bordered on the west by Vermont, Massachusetts on its south, Quebec to its north, and Maine as well as the Atlantic Ocean to its east. New Hampshire is the 5th ranked least extensive state in the country with a total land area of roughly 9,304 square miles, and it is the 9th ranked least populated state with a population of roughly 1.32 million as of 2011. The capital of the state is Concord, however the largest city in the state is Manchester. Interesting to note is that it has no general sales tax and additionally personal income is not taxed at state or local levels. New Hampshire broke ties with Great Britain during January of 1776, and then only six months later it became one of the thirteen original states in the country. It was also the first state in the country to create its own state constitution. Today, the states major recreational attractions include hiking, snowmobiling, skiing, and various other winter related sports due largely in part to the big ski mountains along the East Coast. The major industries in the state are primarily lumber, textiles, electronic equipment, tourism, and software creation. The 14th president of the United States, Franklin Pierce, was born in New Hampshire and served in office from 1853 to 1857. The states main bodies of water include the Connecticut River, Merrimack River, Androscoggin Rover, and Lake Winnipesaukee. The highest point of elevation in the state is Mt. Washington which stands 6,288 feet above sea level. The state nickname is the “Granite State” and the state motto is “Live Free or Die”. The state bird of New Hampshire is the Purple Finch, the state animal is the White-Tailed Deer, the state freshwater game fish is the Brook Trout, the state saltwater game fish is the Striped Bass, the state flower is the Purple Lilac, and the state tree is the White Birch. While the state of New Hampshire may be small in comparison to most of the other states in the country, its economy and stands right up there with the best of them. Dixville Notch (population 12) is best known in connection with its longstanding middle-of-the-night vote in the U.S. presidential election, including during the New Hampshire primary (the first primary election in the U.S. presidential nomination process). In a tradition that started in the 1960 election, all the eligible voters in Dixville Notch gather at midnight in the ballroom of The Balsams. The voters cast their ballots and the polls officially are closed when one-hundred percent of the registered voters have voted, sometimes one minute later. The results of the Dixville Notch vote in both the New Hampshire primary and the general election are traditionally broadcast around the country immediately afterwards. New Hampshire has 161 miles (259 km) of the trail. The New Hampshire AT is nearly all within the White Mountain National Forest. For northbound thru-hikers, it is the beginning of the main challenges that go beyond enduring distance and time: in New Hampshire and Maine, rough or steep ground are more frequent and alpine conditions are found near summits and along ridges.